The Facilities and Auxiliaries Committee of the Indiana University (IU) Board of Trustees have approved three architectural designs — two for the Bloomington campus and one in Indianapolis — and one project for a planning study in Indianapolis. Beth Feickert, a capital planning project specialist for the IU office of the vice-president for capital planning and facilities, reported on the university’s website that Thomas A. Morrison, the university’s vice-president for capital planning and facilities, presented Bloomington campus designs including a golf course renovation and the renovation and relocation of the Metz Carillon. The redesigned golf course, which will include a new clubhouse and driving range, will feature new hole layouts that challenge beginning through advanced golfers. The course also will be revitalized by returning part of the current course to native landscape, including the addition of about 70 acres of new trees, shrubs and other plantings to replace and augment dead or diseased trees. Golfers will be able to choose from several tee box locations, and the greens will be designed for the approach shots of many skill levels. The par-71 course has a maximum yardage of about 7,700 yards and a minimum of about 4,500 yards, depending on the tee location selected. At the intersection of three existing pathways in the Arboretum, the new 162-ft. tower housing the Metz Carillon will serve as a beacon and gathering place for the campus. 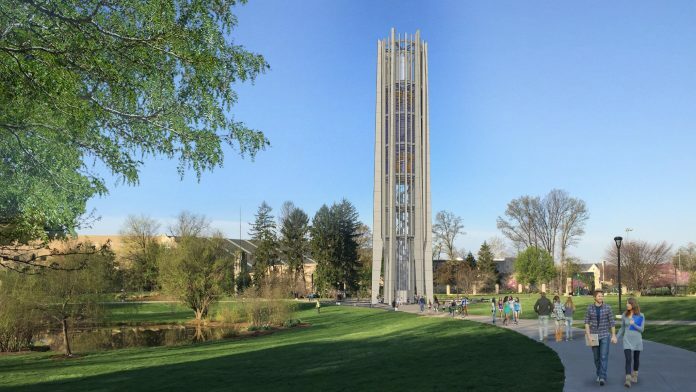 The carillon’s current bells will be refurbished and four new bells added to upgrade the instrument to 65 bells, making it a grand carillon. Six vertical limestone piers will form the primary structure of the tower, with smaller vertical stone fins forming a radial structure and horizontal steel rings unifying the tower and providing bracing. A glass enclosure above the instrument’s bells and playing chamber will provide evening illumination. The radial structure of the tower will be reinforced in the plaza below, which will include benches to encourage use of the plaza as a gathering place. 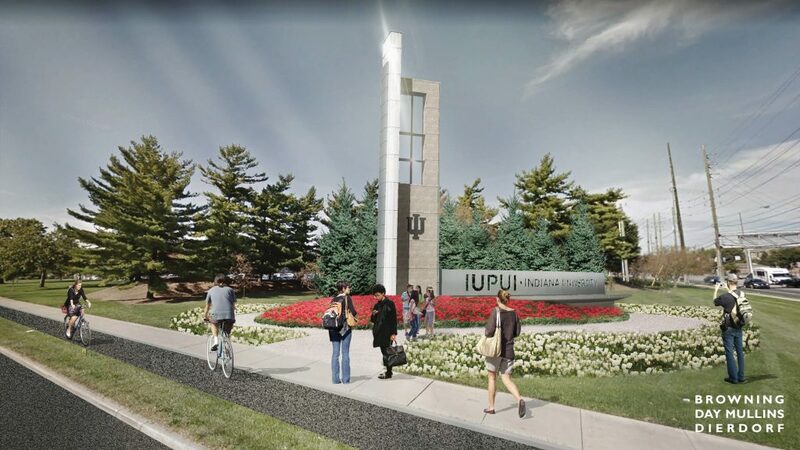 The Board of Trustees also approved two new campus gateways at Indiana University-Perdue University – Indianapolis (IUPUI) — one at the corner of Michigan and West streets and the other at New York and West streets. For the IUPUI campus, the design of two new campus gateways was approved: one at the corner of Michigan and West streets, and the other at New York and West streets. A series of landscape mounds along West Street between the two gateway markers also will visually distinguish the campus from the surrounding city. The gateways will be composed of limestone, stainless steel, precast concrete and glass, and they will be illuminated at night to clearly mark these major entries into the campus. Also included in the design proposal were landscape enhancements for the medians on Michigan Street between West Street and Porto Alegre Street, and for New York Street south of parking lot 63. A study for the development of a sports district aimed at strengthening Indianapolis’ position as a leader in sports industry also was approved for the IUPUI campus. The study will assess current space utilization, facilities and infrastructure in an effort to co-locate several sports-related organizations and facilities. This physical proximity will provide and increase collaborative opportunities in education and innovation for sports industry and Indiana University students, faculty and staff. The project will be coordinated by Indiana University with the Indiana Sports Corp. and the State of Indiana.